If I have to hear one more Mannheim Steamroller Christmas song, I’m going to pass out. Seriously. 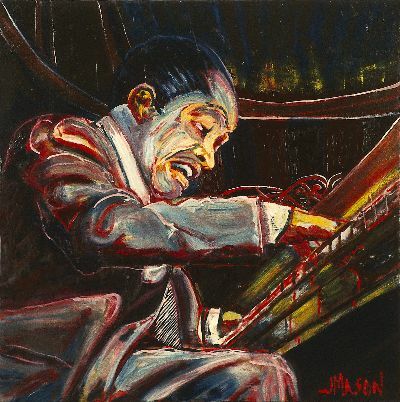 That’s why I’ve chosen to feature this little gem on our site ~ Duke Ellington’s “Three Suites”: an album containing the Jazz legend’s own treatment of Tchaikovsky’s Nutcracker Suite, Grieg’s Peer Gynt & an original, Suite Thursday, based on Steinbeck’s “Sweet Thursday” novella. Take a listen to Sugar-Rum Cherry, originally known as Dance of the Sugar Plum Fairies (does anyone remember the Ren & Stimpy episode with the “Bloody Head Fairy” that was set to this tune? A Classic!). Watch out for Harry Carney’s sultry Tenor Sax solo on this groove that sways like Uncle Leo after too much eggnog. Duke deftly uses his masterful rhythm section of Sam Woodyard & Aaron Bell, on Drums & Bass, respectively, to make In The Hall of the Mountain King swing hotter than a two-dollar pistol, and twice as loud! Do yourself a favor ~ pick up a copy of Three Suites…. This entry was posted on Saturday, December 20th, 2008 at 3:18 pm	and is filed under Inkhaus News. You can follow any responses to this entry through the RSS 2.0 feed. You can leave a response, or trackback from your own site. I’m searching for some information on Alto Saxaphones and I’ve just come across your website! An interesting read which I thought to be of use. I will return be able to take in more.